If you only use Facebook on your home PC, this information may not apply to you. However, if you're like me, and you access your Facebook every chance you get - on your mobile phone, your laptop, your work computer, the library, free wi-fi in coffee shops and airports all over the US, your friends' houses, etc., then this is good information. Do you always remember to log out of Facebook when you access the web from some place other than your home PC? Always?! OK, let's say (hypothetically) that you just remembered that you accessed your Facebook account from the public library, and forgot to sign out. Yikes! That means that there is a possibility that the next person to sign in to Facebook from that computer could be logged in as you. Not good. Remain calm. Log-in to your Facebook account from wherever you are now, go to "Account," then "Account Settings," then "Account Security." (Or click HERE, or on the photo above). You'll be able to see every place that you are currently logged in. 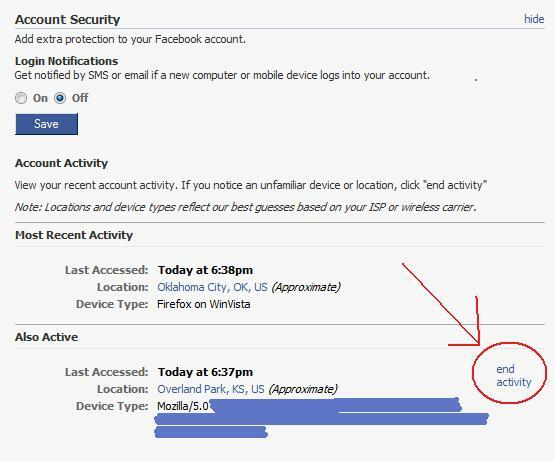 If you're logged in any place other than your current location and/or your mobile phone, you should end those sessions by clicking "End Activity.' Done. "...(W)e're launching one-time passwords to make it safer to use public computers in places like hotels, cafes or airports. If you have any concerns about security of the computer you're using while accessing Facebook, we can text you a one-time password to use instead of your regular password. Simply text "otp" to 32665 on your mobile phone, and you'll immediately receive a password that can be used only once and expires in 20 minutes. In order to access this feature, you'll need a mobile phone number in your account. We're rolling this out gradually, and it should be available to everyone in the coming weeks..."
Good job, Facebook. Looks like you're using the publicity from your movie melodrama wisely.